Let's see......we're still in Hawaii, although we almost weren't. We aren't having any luck finding a sailboat here and we find so many great deals in California, it almost makes sense to go back to the mainland to work and find our boat there, but it seems Hawaii isn't done with us yet, so we're still here....for now. I imagine it'll still be another couple months before we find THE boat, we're still learning and figuring out what we want vs what we need. BTW....boat shopping MUCH MORE difficult than RV shopping. I slacked off a little on my walks but yesterday convinced Jonas and Jewel to hike back into Waianae Valley with me and my friend, Annie. I was told there are ponds up in the streams and if we're lucky we can find an Icy Pond. 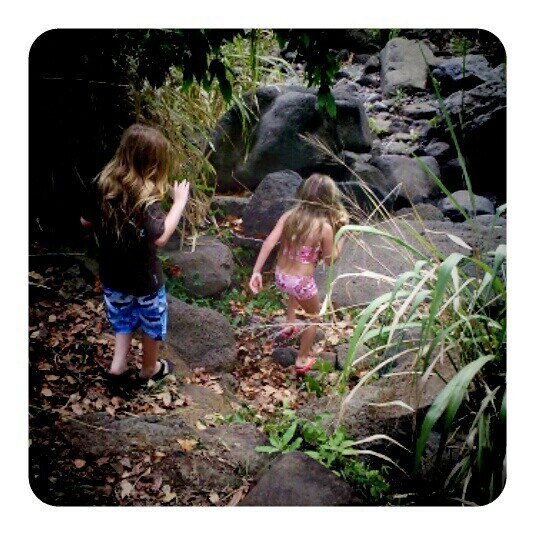 So with the lure of these secret ponds the kids were actually pretty eager to go. All except Jake. He wrangled his rope like arms and legs around the bar stool frame and clung on for dear life, stating: "I just woke up and I don't want to go". It was already after 9 and I had wanted to be on the trail by 7 as to avoid the heat, so I stopped begging and let him be. First we walked up to the water tower where we waited for Annie. 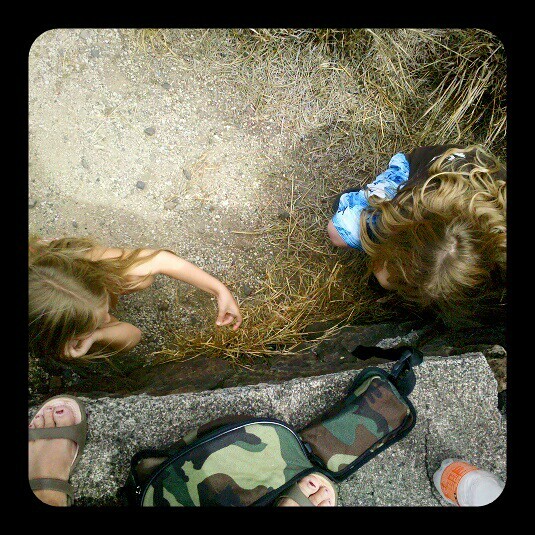 While waiting the kids found the only shade they could, along an ancient three foot high wall. As soon as Annie caught up to us we took off into the valley and across our first dry stream. Where Jonas promptly slipped on loose sand and gravel and fell HARD right on his back. The picture was taken just seconds before the fall. Jonas is a tough kid and doesn't like to show weakness, but he was hurting something fierce. I had him lie down in a soft bed of leaves for a while before slowly getting him back on his feet. I figured we'd have to turn around at this point, but after about thirty minutes he was ready to go again....so on we went. 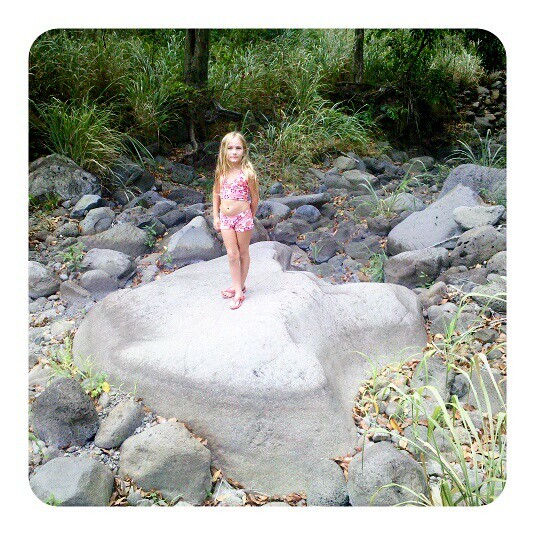 I couldn't decide if this giant rock looked more like a dinosaur footprint or an arrowhead. It does look a lot like the footprint we saw in Utah. Only much larger. 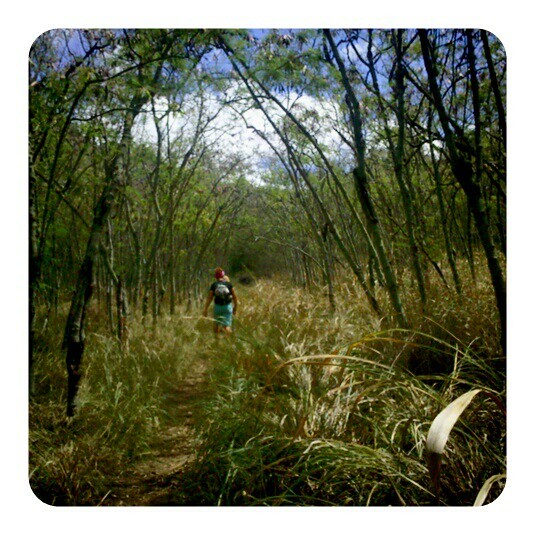 After the stream we walked along a dirt trail in the trees and scrub for a while, before coming to the largest Mango tree we've ever seen. There were literally thousands of mango seeds under it's umbrella that had been ravaged by the wild pigs. Not one edible mango to be found. 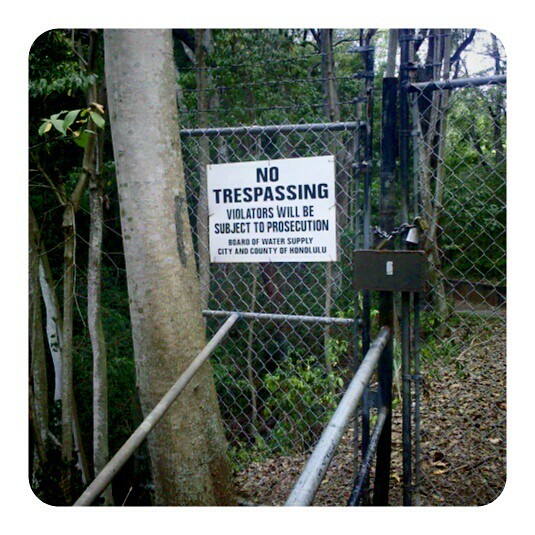 I would have stopped here but Annie showed us how to cling to the side of the fence hovering over the stream twenty feet below and swing ourselves around. It's all her fault. 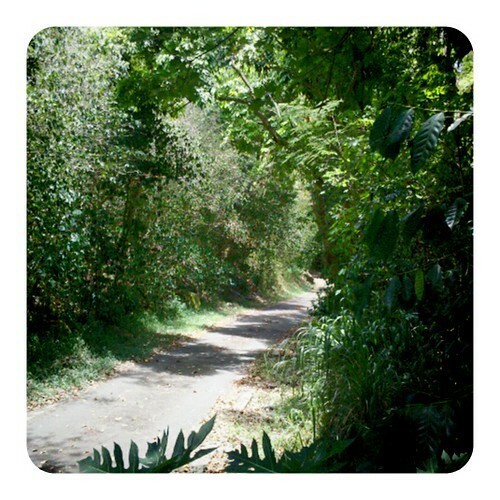 Now we're on a paved road leading up to a city of Honolulu well. I didn't know we'd be on a road. I was hoping we'd be in the rain forests by now! 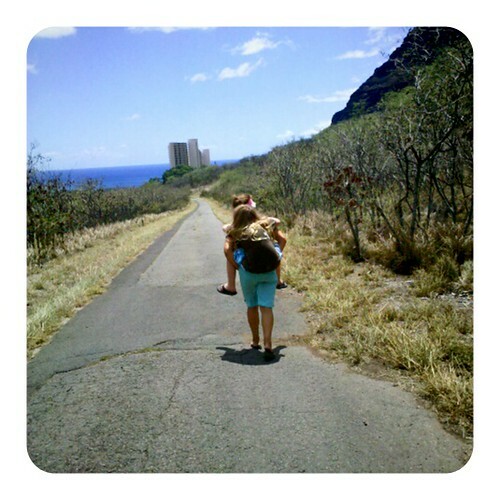 Luckily it's kind of overcast and breezy so the uphill hike isn't too too bad for the kids. We do stop often for breaks. We are also on the look out for fruit and coffee. We need some breakfast. We picked all we found, about a dozen that were on the ground, and ate a few along the trail. They were different. Sweet, but sour, and a little like pomegrants in their texture. I'll like them better mixed in fruit smoothies, rather than just by themselves. 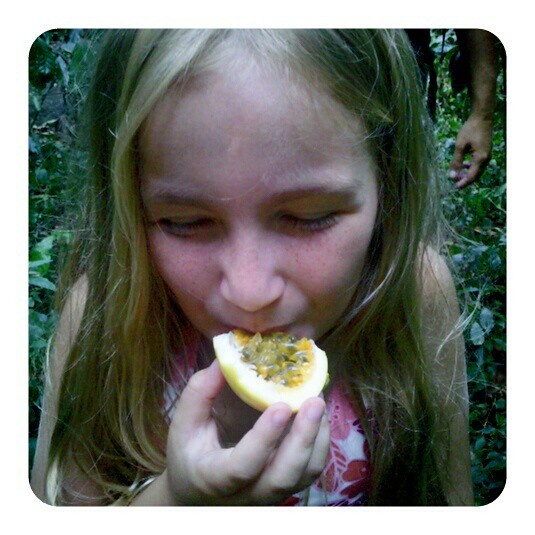 They are a type of passion fruit. Another tree we learned about on this hike were the coffee trees. I know they are abundant here but I never knew which ones they were, and now I do and now I can't wait to find some ripe beans to send to my mom. 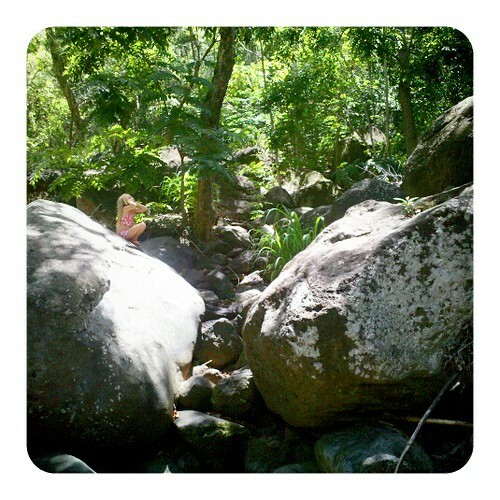 After taking a slight detour to find the Lilikoi we found ourselves off trail and bouldering straight up the stream. 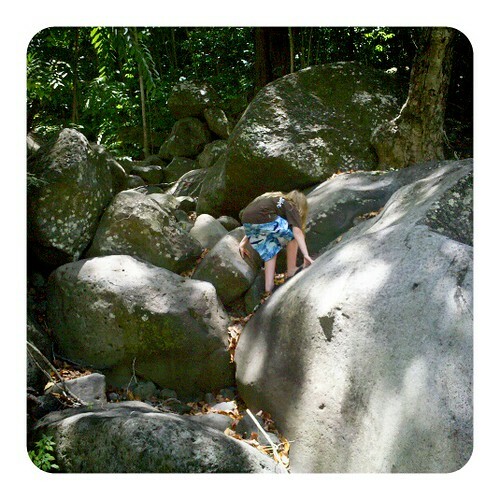 While Annie and I could climb these boulders all day, it wasn't the easiest thing for the kids, plus we were all in crocs & flip flops. 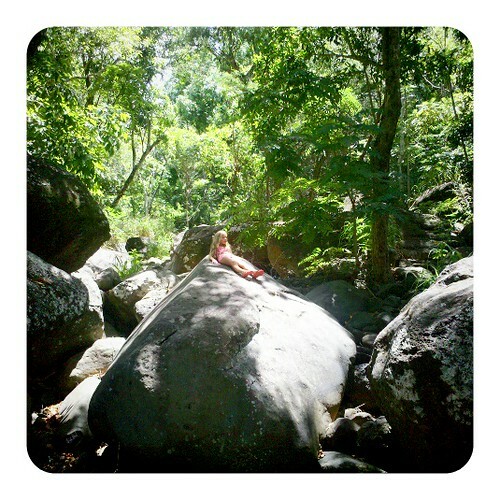 I could just see one of us getting our foot jammed under moving boulders. Finally we found our way back to the road, but by this time the sun was really blaring. I asked Jo0nas if he wanted to turn around but he actually said....We've come this far, can't stop now.....wow! I was impressed with him. He hurt his back really bad, hates hiking, hates being in the sun, yet wanted to continue on in our search for some water to jump in. We've been hiking for about three hours at this point and there isn't even a trickle in the stream, so hopes of finding a water filled pond are not looking good. We're still on a water company road and it's just getting steeper so I finally make the call to turn it around. As we're walking back down a City of Honolulu truck is making it's way up and I try to ignore him as I walk by but he stops me anyway. He just kind of scolds me, I play stupid, and we keep on walking. 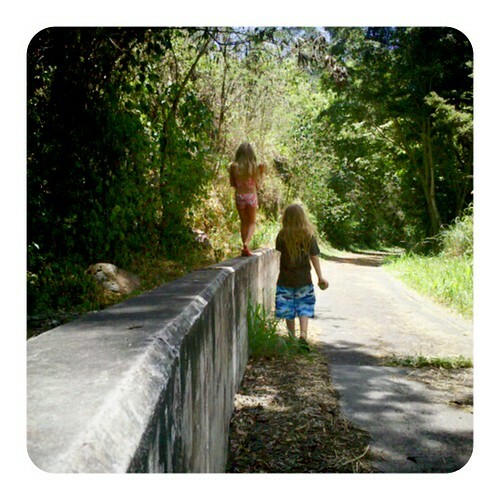 At the heiau I take some pictures of Jewel and Annie in the trees and then we look for our trail that leads us back over to the water tower. We failed. We ended back up in another creek with big, loose boulders, and by this time it is really, really hot and our feet our hurting us. Jewel may have started to whine a little bit. If it wasn't her, it would have been me. We now have to turn around, and cut through the thick brush rather than tackling anymore of the stream, and find the trail. Thankfully it didn't take too long, and another thirty minutes later and we were back at the large mango tree. The kids were never so excited to see a tree. Getting back to our side of the valley was nice, since we knew we were on the last stretch, but it was two in the afternoon now, there wasn't a cloud in sight, and no breeze to cool our sweat. It was probably the worst part, and we just couldn't wait to get to the watertower and start heading back downhill. Jonas even managed to hitch a ride with Annie. We ended the hike swimming in the pool at the Towers for about an hour before we had to slip our crocs back on and walk the last half mile home. Don't think I didn't almost ask Annie to drive us back...cause I almost did. 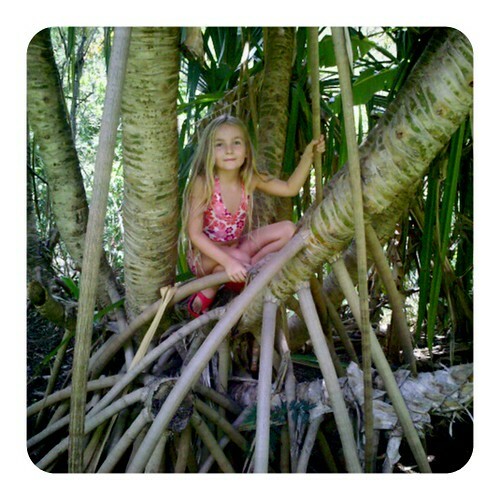 We didn't get to see any icy ponds, but we learned a lot about the foliage here in Hawaii that we didn't know. Jonas learned that he's a lot tougher than he gives himself credit for. We got to try new exotic fruit, and learn even more after coming home to research them further. We had an excellent workout, with beautiful scenery, and good company. So even though the kids will never do that hike again, it was worth every ache and mosquito bite.